is played at the dances? The dance club hires dance bands which play big band music. The bands range in size from a four person combo to 15 piece orchestra. Dance Club members’ dues are used to hire the bands and pay for all expenses for a season of dances. 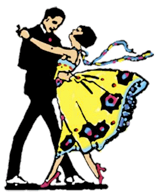 LCD members take turns leading the club by promoting, hosting or providing lessons before the dances. Member support through dues or volunteer time is essential to the club’s existence. Many dancers and styes of dancing can be accommodated on the dance floor at the same time using these simple dance floor etiquette guidelines. Couples should dance counterclockwise around the dance floor for dances that travel such as waltz, foxtrot, polka and tango. Don’t go against the line of dance for more than a few steps. • Stay in the proper section of the dance floor..... Faster moving couples should stay to the outside of the dance floor. Slower moving couples should stay to the inside of the dance floor to avoid blocking or running into other dancers. Non-circling and spot dances such as swing, cha cha and rhumba use the center of the dance floor. • Only dancers are on the dance floor when the music is playing. Who can attend the dances? Guests are welcome to attend any summer or winter club dance. The dance admission may be applied toward membership if deciding to join during the dance. Season Memberships are available for Couples, and Individuals, with special rates for 17-30 year olds. Is food served at the dances? A full bar service is available in the ballroom during the dances. No “outside” food or drink may be brought into the ballroom. Also on premises is a full service dining room. What type of shoes are best? Expert dancers inform us that leather or felt soled dance shoes provide the smoothest and safest dance experience.